Mesa Air Group Inc. said yesterday its Hawaii flights were 62.9 percent full in October, down slightly from the previous month. Mesa's interisland startup, go!, which began service in June, carried 60,466 passengers last month with an on-time arrival rate of 89.4 percent. The carrier was forced to cancel some flights because of the Oct. 15 Big Island earthquakes. 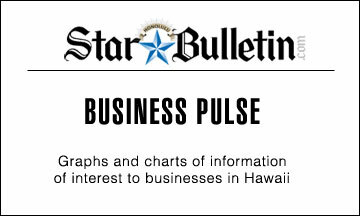 The interisland carrier's load factor has been in the 60 percent range since August, after reaching 82.5 percent in June and 74 percent in July. » Lisa Harding has joined Prudential Locations as a real estate professional. She has worked with clients across Oahu, selling condominiums and houses ranging from $200,000 to $1.2 million. » Aqua Hotels & Resorts has hired Derek Paulin as director of safety and guest relations. Paulin previously served at Marc Resorts and Aqua Hotels for several years in various management positions. » Kona Village Resort has hired C. Haunani Dudoit-Kary as wedding coordinator. She will oversee all wedding arrangement details such as marriage licensing, flowers, musicians, clergy, champagne toasts and gala receptions. She has held a variety of management positions over the past 10 years at resorts on the Big Island and a local destination management company. » Bays Deaver Lung Rose Baba has hired Sunny S. Lee as an associate. He will service clients in all areas of the firm's concentrations, including real estate, construction law, insurance defense, business and real estate transactions, and trust and litigation. Lee previously served as a law clerk in the state Circuit Court System, and as an associate attorney in Seattle. 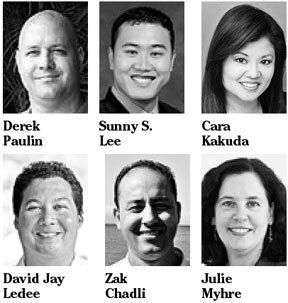 » Hawaiian Telcom has hired Cara Kakuda as director of wireless business sales. She will head the company's wireless sales team and primarily focus on establishing steady wireless business customers. Kakuda is a veteran wireless executive who recently served as general manager for Nextel Hawaii and managed her own company, Cellular Distributors, from 1989 to 1995. >> Marriott International Inc. has hired Charlene Nakamura as director of national accounts for the company's Hawaiian Islands hotels and resorts. She will be responsible for booking group business in the association market for the company's resorts in Hawaii. She previously served as national sales manager for the former Renaissance Ilikai Waikiki Hotel. » Hyatt Regency Maui Resort and Spa has hired David Jay Ledee as sushi chef for its Cascades Grille and Sushi Bar. He will be responsible for preparing more than 60 varieties of maki and nigiri sushi and sashimi. Ledee has more than 16 years of experience as a sushi chef at well-known Japanese and seafood restaurants in California and Hawaii. » Nanopoint Inc. has hired Michael Powell as chief scientist. He has more than two decades of experience in the life sciences industry. His work has lead to breakthrough discoveries and recognition within the scientific community. » Napili Kai Beach Resort on Maui has hired Zak Chadli as executive chef. He will oversee all culinary and catering functions of the property, including the resort's signature beachfront Sea House Restaurant. 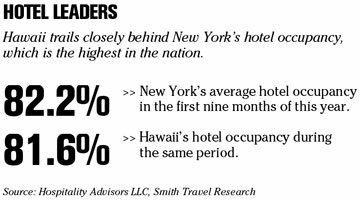 He previously worked for several Hawaii hotels, then moved to the mainland to serve as assistant executive chef at the Beverly Hills Hotel. Last year, he opened his own restaurant in San Francisco. » SSFM International has hired Julie Myhre as project manager and senior environmental planner for the company's Big Island operations. Her expertise includes working with regulatory agencies, project planning and scoping, budgets and schedules and oversight of environmental inspection. Myhre previously was as senior environmental engineer and founding partner at the Natural Resource Group in Minneapolis. » Watts Constructors has hired Daniel Vasilash Jr. as safety director. He will oversee management of the corporate safety program in all of the company's operations in the continental U.S., Alaska, Hawaii and Micronesia. Also, Thomas Reilling has been hired as senior safety administrator, and Liese Barnes has been hired as safety administrator. SAN FRANCISCO » Kaiser Permanente's health plan and hospitals reported yesterday that net income rose 37 percent in the third quarter, a gain the health maintenance organization attributed to a reduction in workers' compensation and professional liability claims. While Detroit's automakers retrench to stem their losses, Toyota Motor Corp. is expanding its competitive advantage as it rakes in the profits. Toyota predicted yesterday that it would earn a record $13 billion for the year after reporting a 34 percent surge in its second-quarter profit, reflecting strong vehicle sales and a weaker yen. Toyota's U.S. shares jumped after the company said it earned $3.4 billion in the three months to Sept. 30, the second quarter of the Japanese fiscal year, beating analysts' expectations. The earnings come in sharp contrast to Detroit's automakers, which lost a combined $7.4 billion in the third quarter. Ford Motor Co. lost $5.8 billion and DaimlerChrysler AG's Chrysler Group lost about $1.5 billion. General Motors, which has started to rebound after losing $10.6 billion in 2005, posted a $91 million third-quarter loss yesterday. HANOI, Vietnam » Intel Corp., the world's largest chipmaker, has received permission to increase its initial investment in Vietnam from $300 million to up to $1 billion, a Vietnamese official said yesterday. Intel is constructing a $300 million chip assembly and testing plant in Ho Chi Minh City. Its original license, granted in February, allowed the company to invest up to $605 million. The government has since approved an amended license allowing Intel to invest up to $1 billion and increase its production capacity, said Nguyen Anh Tuan, director of the Information Technology Industry at the Ministry of Telematics. The deal is considered a significant step forward in Vietnam's campaign to attract foreign investors. It is already the largest single U.S. investment in the country since the Vietnam War ended in 1975.